Well, I think I am about recovered from the show and its aftermath. My niece, Katie, and I managed, with the help of several others, to get the show set up in less than 2 hours on Friday evening and then headed home to get the labels made up and last minute items ready for the show. My daughter, Chelsea, and the grandkids, along with my other niece, Brita, arrived a bit later and we stayed up a little later than would have been smart! Katie and I woke up early and along with the grandson we were at the church before 8 to do the finishing touches. GS counted the quilts and we had 70 quilts in the show! 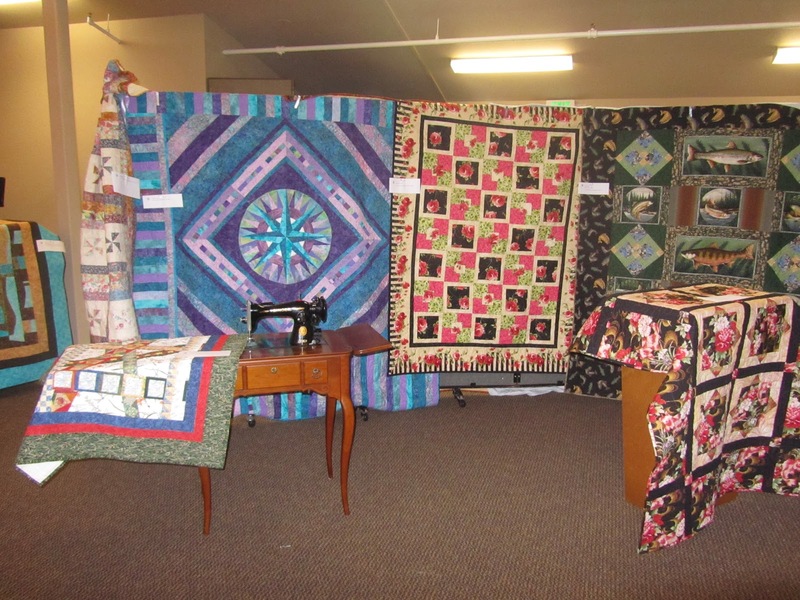 And of those 70, 18 were from other quilters in the community. After the flood and remodel at the church we had to rethink our set-up for the show and I think it was our best so far. Here is one picture from the show and if you want to see more you can head on over to Flickr. We had a good turn-out and lots of positive feedback from those who came. After the show we got things tidied up and left a few quilts up for church and headed home and had our pizza dinner (no one had the energy to cook something!) and we were all ready for bed by 8! Luckily we had to spring ahead so we can say we went to bed at a more respectable 9! Sunday was a day filled with much activity and I was so tired. I so wanted to take a snooze while the kids watched a movie but it is so hard to sleep when one child is squirming next to you on the couch and the other is squirming on top of you! I was happy to talk Brita out her Lumberjack Barbie birthday cake and into a chocolate cake (her birthday was Saturday) with chocolate cream cheese frosting! Yesterday morning everyone was packed in the car and on their way and then after I had started washing sheets and towels, I got a call that they were coming back - too much snow on the pass - so we got an extra afternoon and evening with the crowd. 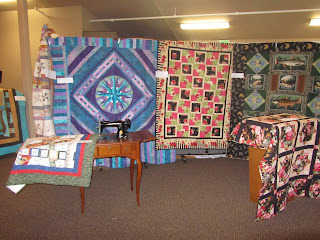 I did get all the quilts returned to their owners yesterday and got to the bank to deposit the proceeds from the show. Today I am again doing the washing and getting caught up on some things and generally being lazy! Tomorrow maybe I will tackle getting the sewing room cleaned up some!